Flight 723 was cleared for a contact approach to runway 10. 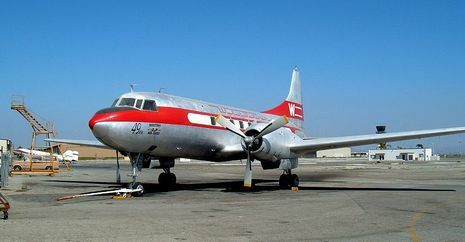 On final approach, while still miles west of the airport, the Convair descended too low, and, at an altitude of 308 feet (94 m), struck a set of three 365-foot (111 m)-tall radio masts arrayed east to west. The right wing struck the center tower of the three, then the left wing struck the east tower. Seven feet of the outer panel of the right wing including the right aileron and control mechanism from the center hinge outboard together with 15 feet of the left outer wing panel and aileron separated from the aircraft. Ground impact occurred 1,590 feet (480 m) beyond the east tower. At this point, the aircraft had rolled to a partially inverted attitude. The nose and left wing struck the ground first. The rest of the airplane fell to earth in short order and caught fire. The aircraft narrowly missed hitting a trailer park on the Albany-Schenectady road. All 28 occupants on board (25 passengers, 2 pilots, and a flight attendant) were killed. All 25 passengers and the three crew members rode to their death yesterday as an American Airlines plane crashed, exploded and burned near Albany Airport after striking two radio towers. On finals for runway 10, the Convair descended too low. The right wing of the aircraft struck the center tower of three radio towers at a point 308 feet above the ground. The left wing then struck the east tower. Seven feet of the outer panel of the right wing including the right aileron and control mechanism from the center hinge outboard together with 15 feet of the left outer wing panel and aileron separated from the aircraft at this time. Following the collision with the towers, ground impact occurred a distance of 1,590 feet beyond the tower last struck. First ground contact was made simultaneously by the nose and the left wing with the aircraft partially inverted. The weather reported at the time of the accident was thin scattered clouds at, 500 feet, ceiling estimated 4500 feet, broken clouds, visibility 1-1/2 miles, fog.